Xibaipo is a beautiful small mountain village with dark green pines and cypresses. It lies in Pingshan County, 80 kilometers away from Shijiazhuang. It was first built in the Tang Dynasty and was originally named "Baibo" In 1935, a school teacher changed "mo"into "po" and this is the origin of the name Xibaipo. In May, 1947, the Working Committee of the Central Committee of the CPC led by Liu Shaoqi and Zhu De entered and stationed in Xibaipo in advance. They held the National Land Conference here and enacted and implemented "the Outline of Chinese Land Law" In May, 1948, Mao Zedong, Zhou Enlai and Ren Bishi led the Central Committee of the CPC and the headquarters of the PLA to move to Xibaipo. It was here that they organized and commanded the world-shaking Three Decisive Campaigns, namely, Liaoshen Campaign, Huaihai Campaign and Pingjin Campaign. It was also here that they held the significant "the Second Plenary Session of the 7th Central Committee of the CPC" On May 23rd, 1949, Chairman Mao and the Central Committee of the CPC left Xibaipo for Beijing. Xibaipo was written into the annals of Chinese revolutionary history for its special contributions, and it is an everlasting monument of history. At present, in front of Xibaipo, there is Xibaipo Lake where the surface of the lake ripples and the water is wavy. Behind Xibaipo is Xibaipo Hill where there are many cypresses on the slope and you can hear the whistling of the wind in the pines. The lake and the hill add radiance and beauty to each other, which forms the charming and beautiful scenery. Xibaipo is a national base for patriotic education. The main sights are: the former site of the Central Committee of the CPC, the exhibition hall, the multifunctional movie & TV hall, the monu-ment, the garden of stone carvings, the bronze statues of the five leaders (Mao Zedong, Liu Shaoqi, Zhu De, Zhou Enlai and Ren Bishi), the garden of the sculptures of the leaders"elegant demeanours, and the tablet with Zhou Enlai's remark on it. Starting from Beijing, you can drive southward along Beijing-Shenzhen Expressway, take Shijiazhuang-Taiyuan Expressway at the Shitai Exit, get off at the Shiqing Exit, go along Shi-Yan Road, pass by Pingshan County to Changyuling, turn right, pass by Gangnan and Sujiazhuang Village, take G207 to Xibaipo. By train: Get off at Shijiazhu-ang North Station, and take a regular sightseeing bus. Zhaozhou Bridge is also called Anji Bridge. It is on Jiaohe River to the south of Zhaoxian County town, 45 kilometers southeast of Shijiazhu-ang. Because the whole bridge was made of stone materials, it was called Big Stone Bridge by the local people. It was first built between A.D. 595-605 and the construction was supervised by Li Chun, a famous craftsman in the sui Dynasty. The structure of Zhaozhou Bridge is original, and the appearance is beautiful. The ancient people said that "The architecture is so novel that nobody knows how it was constructed. "The bridge is 64.4 meters long, 9.6 meters wide and the span is 37.2 meters. It is an arc bridge made up of 28 comparatively separate arches. 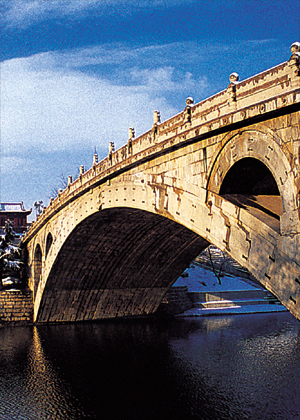 The greatest scientific contribution of Zhaozhou Bridge is its pioneering work of "shoulder arch" At each shoulder of the main arch, there are 2 small parallel arches. This not only increases passages for the running water, decreases the weight of the bridge, and saves stone materials, but also enhances the stability of the bridge. Therefore, though 1,400 years has passed, having undergone many floods, eight earthquakes, and heavy traffic, it is still standing firm over Jiaohe River. 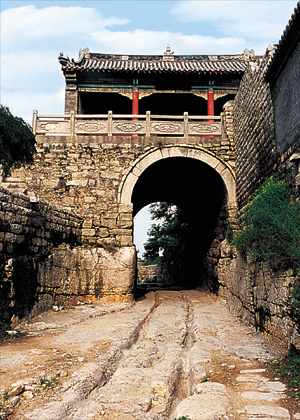 There are many beautiful legends about the construction of Zhaozhou Bridge. In the past, Jiaohe River overflowed, and the local people could only ferry across by wood boat. Lu Ban, the carpenters"ancestor, turned the sheep into stones overnight to make the bridge.Zhang Guolao and Chai Wangye, two immortals, came to test the solidity of the bridge. Zhang Guolao rode on the donkey-back, facing backward. In the long bag on the donkey-back, there were the sun and the moon. Chai Wangye pushed a one-wheeled cart, on which there were the five famous mountains in China. When they came to the middle of the bridge, it began to shake and was likely to fall down. Seeing the situation was unfavorable, Lu Ban jumped into the water, and held up the bridge with his hands. Luckily, the bridge was safe and sound. So there left on the surface of the bridge clear hoof prints of the donkey and a rut. Lu Ban's fingerprints were also left on the arch of the bridge. Just like what was sung in the folk song "Child Cowherd" "Chaozhou Bridge was built by Lu Ban, and the boulder railings were left by sages. Zhang Guolao passed the bridge on the donkey-back, and Chai Wangye made a rut by pushing the cart on the bridge." Drive southward from Beijing along Beijing-Shenzhen Expressway to the Shijiazhuang Exit, drive along South Tiyu Street, proceed to G308 to Zhaoxian County, and then drive along Zhaozhou Bridge Road to get here. By train: Get off at Shijiazhu-ang Station and go to Huaxia Passenger Station at 180 South Ping'sn Street to take a bus to Zhaoxian County. Bailin Buddhist Temple lies in the southeast corner of Zhaoxian County town, 30 kilometers away from Shijiazhuang. In ancient times, Bailin Buddhist Temple had always been the Buddhist center of the State of Yan and Zhao. 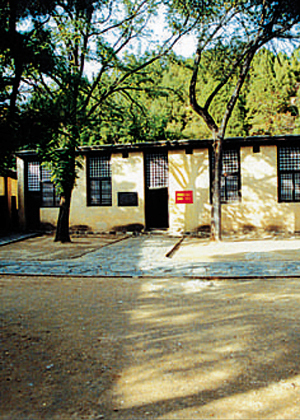 Before going to study Buddhism in India, Sanzang, a famous monk in the Tang Dynasty, studied here for more than one year. There are many eminent monks in Bailin Buddhist Temple history, such as Zhaozhou Chan Master (an honorific title for a buddhist monk) in the Tang Dynasty, Guiyun Old Man in the Song Dynasty, Yuexi Chan Master and Luyun Chan Master in the Yuan Dynasty. Among them, Zhaozhou Chan Master is a master who was remarkable and influential both in the past and at present, and well-known at home and abroad. Nowadays, ministered by Jinghui Chan Master, Bailin Buddhist Temple has taken on a new look, and Buddhism is still flourishing. 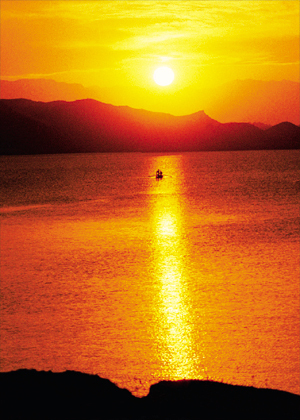 Jinghui Chan Master's "Life's Dhyana"produced a telling influence on the Buddhist world. Each year in May, "Life's Dhyana Summer Camp"attracts students and lay Buddhists from home and abroad to come to sightsee and study. Now, Bailin Buddhist Temple has become a tourist attraction which combines sightseeing, worshiping and vacationing. Drive southward from Beijing along Beijing-Shenzhen Expressway to the Shijiazhuang Exit, drive along South Tiyu Street to G308, pass by Luancheng to Zhaoxian County, and then drive ahead along Shi-Ta Road to get here. By train: Get off at Shijiazhuang Station. Take a bus to Zhaoxian County and get off at Shita Stop, walk ahead to get here. It is located 5 kilometers east of Jingxing County town, and 35 kilometers away from Shijiazhuang. It was first built in the Qin Dynasty. It was built in a valley, running through the Taihang Mountains, with a length of 100 li or so. After Qin Shihuang, the first emperor of the Qin Dynasty (259-210 B.C. ), unified China, he built a post road with Xianyang as the center. It is one of the most important parts of the main stem at that time. Here the lay of the land is such that it is of great strategic importance, which enables it to become a place contested by all strategists. Many famous battles happened here, such as the battle to take a town in 229 BC led by Wang Jian, a general of the Qin Dynasty; the desperate battle in 204 BC led by Han Xin, a general of the Han Dynasty, who defeated the enemy with a force inferior in number; the battle in 756 AD led by Guo Ziyi and Li Guangbi, two generals in the Tang Dynasty, to put down a rebellion led by An Lushan and Shi Siming, two rebel generals; Gengzi Battle in 1900 led by Liu Guangcai, a general in the Qing Dynasty, making a good start to fight against the Eight-Power Allied Forces. The upgoing stone path to the post road is rather steep, and on both sides of the path there remained some incomplete stone horses and beasts, standing or lying, as well as the stone statues of the civilians and generals in the Ming and Qing dynasties. Going around a col, you will see a grand pass in front of you. This is the East Heavenly Gate, which guarded the ancient post road. On the tablet of the gate, there inscribed four golden Chinese characters on a blue background, "通秦晋" (to the State of Qin and Jin in the west). The East Heavenly Gate is a pass, and consists of the east pavilion and west pavilion, which are less than 50 meters from each other. The two pavilions in the middle are just like two iron locks, which locked the pass tightly. When you get close to the pass, the ancient post road will come into your eyes grad-ually. Two lines of tracks run through under the gateway, and inlaid in the thick and smooth rock road surface. The color of the slabstones is slightly green. After many years of being rolled by wheels, trodden by horse hoofs, eroded by wind and rain, the stones have become as smooth as a mirror. Every 20 meters on the road, there is a protuberant 30-cm-high stone threshold-like thing, which is built for having a rest when going upwards with a heavy load and gliding slowly while going downwards. The reason why this ancient post road was so completely preserved is that at the end of the Qing Dynasty, Zheng-Tai Road was built, and this perilous and rough road was gradually forgotten by people. Drive from Beijing along Beijing-Shenzhen Expressway, take Shijiazhuang-Taiyuan Expressway at the Shitai Exit, get off at the No. 4 Exit, pass by Jingxing County town, and drive northeast for 4 kilometers to get here. By train: Get off at Shijiazhuang Station, go to the passenger station at 358 West Xinhua Road to take a No. 203 regular sightseeing bus, and get off at Dongtianmen. It lies in the north of Pingshan County town, 45 kilometers away from Shijiazhuang. It is a key cultural relic under state protection. It is made up of the site of the capital, an exhibition hall of cultural relics from the emperor's mausoleum, the Stone Buddha Hall at Mount Lin and Wanshou Temple, and is of high archeological and appreciative value. In the exhibition hall of cultural relics from the emperor's mausoleum, there display several thousand fine cultural relics which are full of mystical color. Their exquisite workmanship and best preservation make people acclaim them as the peak of perfection. Especially the stone or bronze chimes, though several thousand years has passed, can still give out tuneful music. The rich historical data and material evidence, show the highly developed handicraft industry and magnificent and unique culture of the ancient Zhongshan State. Mount Lin near here is just like rising from the level ground, the two peaks of which stand opposite each other at a distance. The Stone Buddha Hall at Mount Lin is a key cultural relic under provincial protection. There are 4 caves, more than 2,000 stone statues of Buddha, all of which are cultural relics belonging to the Tang Dynasty. Wanshou Temple at the foot of Mount Lin was so named because Li Chang (whose style name was Tianshou), became a monk here. There are many sights in the temple, such as double yin and yang cypresses, and the tombs and pagodas of eminent monks. Drive southward from Beijing along Beijing-Shenzhen Expressway, proceed to Shijiazhuang-Taiyuan Expressway at the Shitai Exit, get off at the Shiqing Exit, drive northwest along Shi-Yan Road to Pingshan County town, turn north at Mengxianbi, pass by Wangmu, Danyang and Shangsanji to get here. By train: Get off at Shijiazhuang North Station. At the North Station Passenger Station, there are regular sightseeing buses to get here. Zhengding lies 15 kilometers north of Shijiazhuang City, and 260 kilometers away from Beijing. It is a famous national historical and cultural city. Since the Northern Qi Emperor Gaoyang moved the Zhending jurisdiction office of Changshan County to Zhengding, more than 1,430 years has passed and Zhengding has always been the locus of the government office of various levels. During the period of the State of Liao and Jin, it was twice chosen to be the capital of the state. Zhengding has a long history and has " attics, 4 pagodas, 8 temples and 24 golden memorial archways" Longxing Temple, Duobao Pagoda in Guanghui Temple, Lingxiao Pagoda in Tianning Temple, Chengling Pagoda in Linji Temple, Xumi Pagoda in Kaiyuan Temple and the Bell Tower in Kaiyuan Temple are all key cultural relics under state protection. Linji Temple is the birthplace of Buddhist Ancestor Linji. The Longcang Temple Tablet of the Sui Dynasty is well-known at home and abroad. Since the policy of reform and opening up to the outside world, Zhengding is developing gradually into a tourist city famous for its long history and splendid culture. Longxing Temple It lies in the urban area. It was first built in A.D. 586. It was originally named "Longcang Temple"(Temple of Dragon's Shelter). In the beginning years of the Song Dynasty, it was renamed "Longxing Temple"(Temple of Dragon's Prosperity) and in the 48th year of the reign of the Qing Emperor Kangxi (A.D. 1709), it was rebuilt and given the present name, "Longxing Temple"(Temple of Prosperity). It is a key cultural relic under state protection and one of the ten famous extant Buddhist temples. It covers an area of about 60,000 square meters. The main buildings are the Hall of Deva Kings, the Hall of Mahamuni, the Pavilion of Maitreya, the Pavilion of Dhavmachakra Sutrapitaka, the Pavilion of Great Mercy and the Temple of Amitabha. Therefore, the temple was named "Longcang Temple"(Temple of Dragon's Shelter) and then "Longxing Temple"(Temple of Dragon's Prosperity). One of the emperors of the Qing Dynasty regarded it as a taboo that there was "dragon king's prosperity" so he renamed it "Longxing Temple"(Temple of Prosperity). 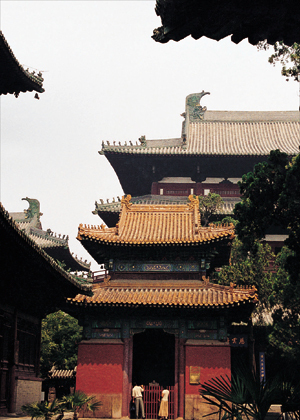 The main part of Longxing Temple was the Great Mercy Pavilion, which was first built in A.D. 971. It has three stories and is 33 meters high. The bronze statue of Kwan-yin in the pavilion is 21.3 meters high and is one of the extant highest early statues. Rongguo Mansion It lies in Zhengding City. It was designed and built completely according to the description in the novel "A Dream of Red Mansions"by Cao Xueqin, and strictly according to the Chinese "Records of Laws and Systems of the Qing Dynasty" It is the first pseudo-classic building complex with the Ming and Qing architectural styles throughout China. It is also the first location of ancient architectures of CCTV. Most of the scenes in "A Dream of Red Mansions" a grand TV play series, were filmed here. Li Hanxiang, a famous director in Hong Kong called it the "Hollywood"in China. Drive southward from Beijing along Beijing-Shenzhen Expressway to the Zhengding Exit, then drive eastward along Andong Road to the crossing and turn south to enter the city. You can also go to G107 from Shijiazhuang North Second Ring Road, drive to Hutuohe Bridge, and then drive eastward along Diding Road to enter the city through the South Gate. By train: Get off at Shijiazhuang Station, take a No. 201 bus at the passenger station south of the Railway Station Square, get off at Zhengding, and then take a No.1, 2, 3, or 4 bus to get here. 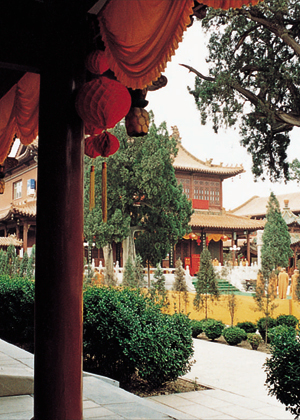 Longquan Temple lies in Luquan County, 15 kilometers away from Shijiazhuang. Longquan Temple has a long history. According to the records in "the County Annals of Luquan" Longquan Temple was built in A.D. 1157, and has a history of over 800 years. On its east is Cuiping, on its west is Wuzhai, on its south is Fenglong Mountain and on its north is Hutuo River. It was maintained or extended in the Jin, Yuan, Ming and Qing dynasties, and thus formed an ancient building complex, in which temples, palaces and pavilions stand opposite to one another at a distance, and wells, springs, ponds and tablets are complete and peculiar. There are many inscriptions by men of letters, high officials and noble lords of every dynasty. 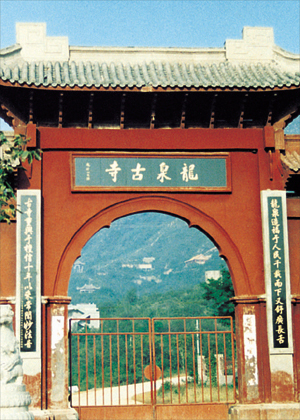 Yuan Haowen, a famous poet in the Jin Dynasty once wrote "All climbers sing high praise of Mount Long, where Longquan Temple is a tourist attraction. "In the scenic area, ridges and peaks rise one after another; gullies are rolling and stretching vertically and horizontally in an unbroken chain; trees of various heights are as beautiful as a brocade and the mountains are covered by wild flowers and fragrant green grass. Everywhere the scenery is as beautiful as a painting and in every season the scenery is pleasant. Longquan Temple is divided into the Upper Temple and the Lower Temple. In the Upper Temple, in front of the simple but elegant Daxiong Treasured Palace is the clear pond water where the fish are swimming freely. The five colorful dragons carved on the pillar of the peculiar-shaped Dragon King Hall are reflected in the Dragon Pond, as if they were dancing elegantly in the ripples. Behind Dragon King Hall, from the cliff of the mountain slope protrudes the "Dragon's Head" out of which pure spring water flows continuously. The Lower Temple is also called Jieyin Palace. The whole architecture is grand and magnificent, which includes Palace of the Founder, Palace of the Senior Pharmacist, Mountain Gate, Colorful Screen Wall and East and West Wing Building. Drive southward from Beijing along Beijing-Shenzhen Expressway, proceed to Shijiazhuang-Taiyuan Expressway at the Shitai Exit, get off at the Luquan Exit, pass by Shangzhuang, drive southwest along Hanzhuang Road for 10 kilometers to Hanzhuang, and then drive along the tourist road to get here. By train: Get off at Shijiazhuang Station, take a No. 25 bus, and get off at Shangzhuang, where there are taxis to get here.